I love both - Kate or Katherine. I say go with Kathrine. I think it's nice to have the option of going with either, esp. as your little girl gets older. Example - my friend Julia was always called Julie by her parents, but elected to be called Julia once she reached college. Both names are beautiful. But for versatility maybe Katherine. I've had a few Katherines in my life and they've gone by many... Kathy, Katie, Kat. 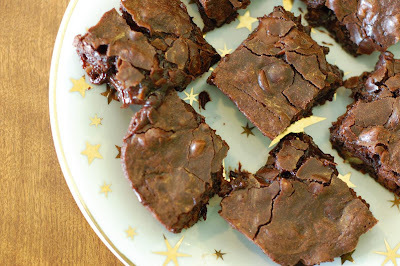 I LOVED these brownies and made them four times this past week with different add-ins. They came out perfectly fudgy everytime. My vote is Kate if you are always planning on calling her that. But either is good! I say Katherine and call her Kate, but that's just me. I like names that are classy, but can be shortened into something fun and cute. I don't do coffee either - but I do do it in my baked goods! And the cinnamon barely added a little kick - I'd give it a try! They look great! And I agree - so easy! The brownies look delicious! I chilled mine so they would cut easier, and it was enough to tame the gooey factor (which didn't return once they were at room temperature). I love Kate, and having a name that people like to shorten against my will (I am NOT Les! ), I say give her the name you want her to be called by. Saves confusion, plus I like short, easy to spell names. No creative spellings to battle, is it with an "e" or an "a"... etc. Kate - all the way. Face it, she'll be a hip, cool kid, and Kate just sounds so with it! Definitely Kate! It is just the cutest. I happen to love the name Katherine...one of the main reasons being the option of using Kate! 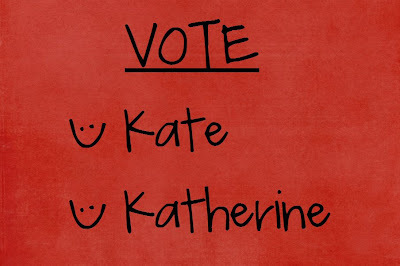 I say go with Katherine so you/she has the option of either Katherine or kate...but either way you can't go wrong!! So exciting! PS - the brownies look awesome! I love using the entire name. I heart these brownies too. Ditto on the versatility. If she grows up and doesn't want to be a "Kate", she has the option to change it. Both are beautiful names, though! I prefer Kate. I know a lot of people are citing versatility as a reason to go with Katherine, but as Kate she can still call herself Kat, Katie, and everything short for Katherine if she chose. Naming her Katherine just in case she wants to go by that as an adult seems like a bad reason when you prefer Kate anyway. I agree that opting for the longer name allows the option of choosing either name. Any boy name suggestions for me?!! Our daugh is a Catherine, but middle name ( only used to emphasize when she was in trouble.) But I love Kate too. too bad you can't let her decide her name when she is older - like the Native American's do. But with Katherine, she has a choice. And the brownies look good. Your brownies look wonderful. You managed to get the dry, flaky top that I did not. As far as the name debate is concerned, I'd go with Katherine even if you plan on calling her Kate. She may choose to go by Katherine later in life...it's always good to have options. Congratulations!! First, I love the way the brownies look. I didn't want a river of goo in mine, so I definitely made sure that they were more on the done side. As for the name, I am so on the fence about this one. I do love both names, though. I guess if you are always going to call her Kate, then just go for it. But, for me, I've liked having the versatility to use my name how I wanted to. I was always Pamela in my family, Pam to my friends. Grew up hating Pamela and now, I'm back to it. I guess it just depends on the person. Either way, Kate or Katherine, she'll be a cutie and keeper!! Good luck! Definitely Katherine. The name has an air of dignity about it, and she can always have the option of letting people that she chooses to call her Kate. I'm partial to Katherine, such a classic name! If I ever have a little girl she will be Katherine, but be called Kitty. If she objects as she gets older, it will be Kate. NO KATIE. We liked these brownies too. Very easy! As for the name. I like Katherine. Then you can figure out the short name later! Very pretty, by the way. Anne Strawberry, I love your site! I just made some cupcakes and used the peanut butter icing you gave a recipe for. Yum!! Both names are pretty. Whichever you choose will suit your daughter perfectly, I'm sure. I'm a huge fan of names which are slightly unusual, though. I like some of the alternative spellings because they set people apart a bit. The Gaelic variations are just so pretty and there's a million options for 'Katherine' based names. Cait, Caity, Katherine, Caitlyn, Kathryn, Catharine, Kathrine, Katerina. I vote for . . . . . . . . . . . . . . . . . . . Katherine, call her Kate . . . . or maybe just kate . . . . heck I don't know!! First of all, the brownies looks gorgeously yummy. Second, I'd go for Katherine. I've got a sister and a niece Catherine, plus a niece Katie as well. I love all the associated names! I like the idea of leaving it wide open with Katherine. I like Katherine ... with the option of being called Kate. My name is Deborah ... called Debbie a lot of the time .... kind of neat to have 2 names! Love your brownies. On the name, it is a beautiful name and I would go with Katherine and call her Kate. That gives her an option when she gets older as well. Plus, on the other side of your thinking, if you name her Kate people will always be asking her if her real name is Katherine. So I would go with Katherine. I have that myself as my name is Peggy which is short for Margaret so I am always asked about Margaret. Hope this helps. Katherine because of all the short endearments you can make with it. 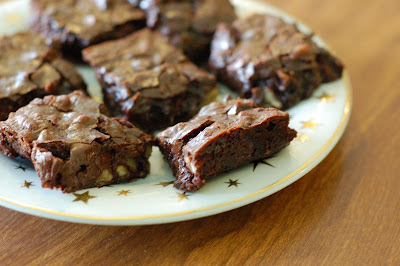 Your brownies look terrific! These were really simple, which I thought was the best part of the recipe. As for the name, I like Kate. Ann, my name is Kathyrn Rose and when I was a little girl I was called Katie Rose. Then I was called Katie in school and now I am called Kate. I will most likely get to Kathryn when I am older. I love having the liberty of changing my name when I want and I love having all the options of spelling my name (Kate, Katie, Katy, Kaytee) What ever you chose, it is a great name! congratulations! So that's what the brownies were supposed to look like! Mine were a gooey underbaked mess but they were tasty. Yours look great though! I'll have to back mine a little longer next time! We named our daughter Katherine and we call her Katie. She is 6. I love that she can switch to Kate as she matures or maybe she'll go by Katherine. I love having options and I love Katherine!! Your brownies look great. I love the name Katie. I love the cracked top! I like Kate better, but see how Katherine might give you more options for either. I am a fan of Katherine and calling her Kate. Then if she wants to be called Katherine later, she has the option. Both are really nice names. Brownies look wonderful and so does your key lime tart/pie! Well first of all I think they are both great names! I think I would vote for Katherine though so that she can use it when she's older if she wants. Plus it's just so pretty and classic. Congrats again! These look yummy! I like my brownies a tiny bit underbaked for that gooey chocolate feeling. MMmm... chocolate. I would go with Kate, since this is what you like best. It's a beautiful name. I'm a Kate (just Kate) and I like it. I've gotten used to the questions (and misspellings). I'd say 90% of the time, people say "Are you actually Katherine or Katelyn?" or "Short for Katherine or Kathleen?". Some people just assume Katherine without asking, so I've had to correct that on forms before. Still, for what it's worth-- I prefer being just Kate.